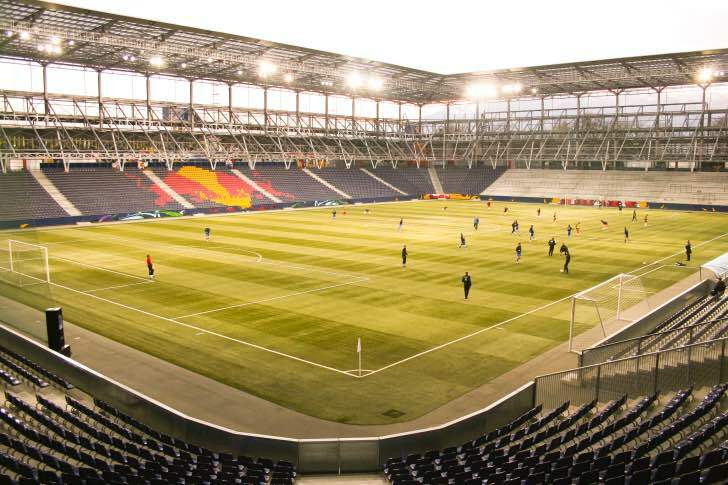 Red Bull Arena opened its doors for the first time 2003, which was two years before Red Bull took over SV Austria Salzburg and renamed both the club and the stadium. Back then it had the name of Stadion Wals-Siezenheim and a capacity of just over eighteen-thousand. There are other Red Bull Arenas in both Leipzig and New Jersey, both with clubs owned by the energy drink manufacturer. None of them are particularly popular with the other teams in their league, with the feeling being that they have essentially been financially doped in order to achieve the success that they have in recent years. For FC Red Bull Salzburg that includes winning the Austrian Bundesliga virtually every season since the takeover, as well as their first ever Austrian Cups. The club was formed from a merger between FC Rapid Salzburg and Hertha FC Salzburg in 1933, taking the name of SV Austria Salzburg. That name changed to SV Casino Salzburg in 1978, then again to SV Wüstenrot Salzburg in 1997. The latter change was down to a sponsorship deal with a financial services corporation in Austria, proving that sponsorship deals have always been part of Salzburg’s history. That said, there’s no question that the takeover by Red Bull on the 6th of April 2005 was the biggest change in the club’s history. In fact, when the company came in they declared ‘this is a new club with no history’, changing everything from the club crest through to the management set up and, of course, the playing staff. With room for just shy of 32,000 people, it’s fair to say that Red Bull Arena is one of the most impressive stadiums in Austria. The arena has two tiers and they run around the pitch in an uninterrupted fashion. 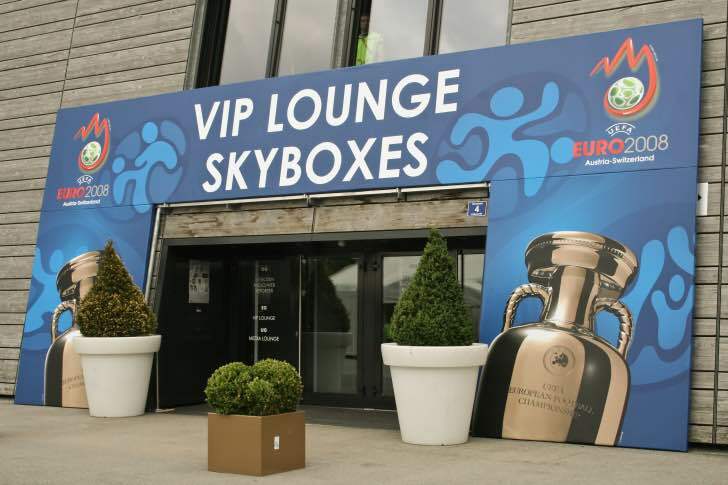 The Sky Boxes are in the West Stand, meaning that that’s essentially the hospitality section and the main stand. Away supporters are housed in the South Stand, with home supporters considering the North Stand to be their main location for the most ardent fans. 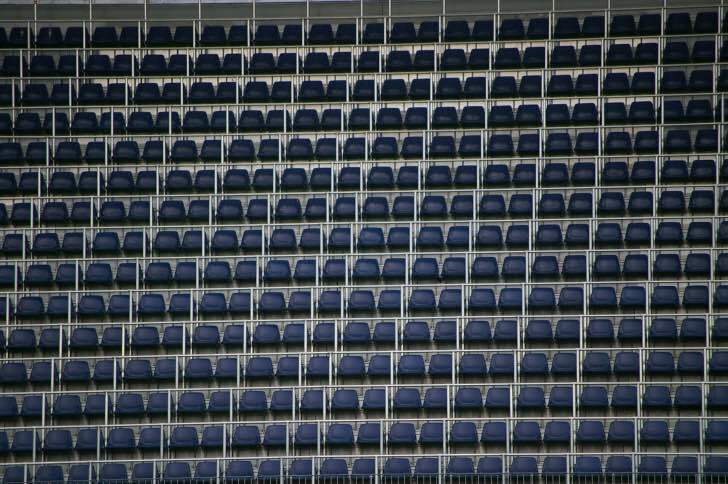 The amount you’ll pay for tickets to see Red Bull Salzburg play their games depends entirely on where in the ground you’d like to sit, as well as how old you are. The most expensive sections are the Upper Tier of the East & West tiers, where tickets can be as pricey as €37 for adults for Category II matches. You’ll pay less than half that to get a ticket in the standing section, with tickets there sitting at around €18. Here’s a look at the cheapest and most expensive tickets for adult, concessions and children. Do bear in mind, though, that you’ll pay an additional €2 on full price and concession tickets if you buy them on the day of the game and that matches are categorised. The best place to get tickets is online, given than they’re €2 cheaper if you buy them in advance. If you want to wait until the day, however, then you’ll be able to get them from the box office as there are almost always tickets available. You can call the ticket office if you prefer to speak to a person than use computers. Train - A train journey from London to Salzburg takes a little over sixteen hours, going via Paris, Stuttgart and Munich, so you might prefer to get to the city by another means. Once you’re there you’ll be able to get a train from Salzburg Hbf to Salzburg Taxham Europark on the S3 Line, from where you’ll have a short walk to the ground. Bus - Buses 1 and 28 run from Salzburg Hauptbahnhof to close to the ground, with an additional soccer bus running from six hours before kick-off. You’ll be able to get on that bus for free if you’ve bought your ticket in advance. Car - Red Bull Arena has its own exit from the A1, so that’s where you’ll be wanting to head if you’re going to a game. By Air - Salzburg Airport is named after W. A. Mozart and is about a mile from the city centre. That’s where you’ll want to fly into, given that the next closest airport is Munich, but that’s about one-hundred and thirty miles away. Taxi - A taxi journey from the main train station in Salzburg out to the ground will take about twenty minutes to complete its journey and will cost you around €20. Red Bull Arena Salzburg has more than two thousand parking spaces, so there’s a decent chance that you’ll be able to park your car if you decide to drive to the match. Boasting just shy of thirty rooms, Snooze Hotel is located about one and a half miles from Red Bull Arena. It’s about a half an hour walk from most of the city’s main attractions, such as Salzburg Museum, Mozart’s birthplace and Salzburg Cathedral, so you’ll be able to fit in some tourist things whilst you’re there. You’ll get free parking at the hotel and you’ll also be able to use their Wi-Fi, plus there’s a terrace area if the weather’s good and you fancy a bit of fresh air. This is the closest hotel to the ground on our list, based just over half a mile from the place. That means it’s about a fifteen minute walk to the ground and that the other major tourist sights are further away. There are fewer rooms here, though, with just eighteen available. You can get a free shuttle to the nearby casino, buy breakfast in the on-site restaurant and even use the meeting room if you need to. Those out in Austria hoping to do some work will be pleased with the free Wi-Fi, plus there’s also free parking if you need it. Another hotel with eighteen rooms, the Gasthof Hartlwirt is located just under a mile from the stadium. It has a restaurant and a lounge, with breakfast being served in the former and coming included with the price of your room. There’s also a garden area, meaning that you can chill out somewhere if you want to. As with the other two hotels on the list, you can park your car for free in the hotel’s car park and you can also use their Wi-Fi. The stadium is a half an hour walk or so, which you’ll want to bear in mind when it’s match day. You’re never going to go too far wrong if you head to a sports bar to catch a football match. When it comes to Two Seasons Sportsbar you’re definitely not going to go wrong, especially not if you like delicious food and decent beers. The bar is named after the idea of the football season being split in two, with the summer and winter seasons offering different things. There are eight flat screen TVs dotted around the place, so you’re not going to struggle to find a spot to watch the live sport. The delicious food we mentioned before includes typical bar food, insomuch as it’s basically a burger joint. There are also loads of pizzas and salads you can get too, though. If an outright sports bar isn’t an option then the next best thing on the list is an Irish pub. The Irish know how to have a good time, so expect a brilliant atmosphere for live sport. There’s tasty food up for grabs too, if you fancy a bite to eat, and, of course, loads of different drinks. Guinness will be top of the list, obviously, but there’ll be some decent Austrian beer on tap as well. In terms of the sport, there are loads of club scarves adorning the ceiling and walls, plus enough TVs around to ensure that you won’t miss any of the action. If you’re a fan of live music then you’ll be pleased to see the small stage, on which bands perform regularly. As the name suggests, O’Malley’s is another pub with an Irish theme. It opened in 1998, quickly becoming one of the most popular bars in the city. It’s made out of wood from a disused Belfast church, which Irish tradesmen then assembled in Salzburg. They serve Guinness and Kilkenny on draft as well as some excellent Austrian lagers, plus you can buy wines, whiskeys, cocktails and more. You can also get some ciders like Magners, if that’s your sort of thing. It’s not the best place to watch sport, but it’s decent enough and it’s quite small, which adds to the atmosphere. There are also snacks available such as pizzas and baguettes, should you get a little bit peckish. As mentioned, the Sky Boxes are located in the Upper Tier of the West Stand, meaning that guests there get an incredible view of the action unfolding on the pitch. There are numerous packages available for those that wish to watch the match in style, so head to the Red Bull Salzburg home page to find out more. The stadium is a multipurpose event venue, so companies are able to hire various parts of the Arena depending on what it is that they want to do. To find out more, get in touch with Red Bull Arena directly. When FC Hertha and FC Rapid merged together to form SV Austria Salzburg, it’s unlikely anybody imagined what would happen in the years to follow. The entire enterprise nearly came to an end when the club was briefly dissolved in 1950, but it was re-formed the following year and made it to the Austrian top-flight just three years later. Erich Probst became the club’s first international player when he lined up for Austria in 1960. The club continued to go from strength-to-strength, finishing as runners-up at the end of the 1971 Austrian Bundesliga season. That saw them enter the UEFA Cup the following season, though they were knocked out by a Romanian club called UTA. In 1974 they reached the final of the Austrian Cup for the first time. They continued to enjoy relative success over the years that followed, reaching the final of the UEFA Cup in 1994 but losing to Italian side Internazionale. That was also the season that they won the Austrian Bundesliga for the first time, pipping Austria Wien to the title by two points. All of that pales into insignificance when compared to the success that the club has enjoyed since Red Bull took over in 2005. They won eight out of eleven league titles between 2007 and 2017, doubling the league win up with an Austrian Cup win on five occasions. The club has acted as something of a feeder side for RB Leipzig in Germany as well as some Premier League sides. Sadio Mané is an example of this, having played for them before being bought by Southampton and eventually moving to Liverpool. Red Bull Arena originally opened in 2003 with the name Stadion Wals-Siezenheim, having taken two years to be completed. Back then it could only host just over eighteen-thousand people, being expanded in time to be used as a host venue for the 2008 European Championships. During that tournament it was known as EM-Stadion Wals-Siezenheim, owing to the fact that UEFA have specific rules regarding venues having sponsored names during their competitions. That’s also why it becomes the Stadion Salzburg when it is used to host UEFA matches in the likes of the Champions League and Europa League. The expansion moved it to the 30,000 mark, with another few thousand being added after that. 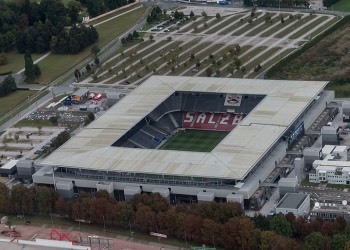 There are two-thousand parking spaces at the ground, which is the most of any stadium in the Austrian league. For a time it was also the only place in Austria that had an artificial pitch, with Polytan’s Ligaturf having been installed not long after Red Bull bought the club. It was returned to a natural pitch in the summer of 2010, however, and that has remained in place since. Designed by Azbie Nuredini, Red Bull Arena cost around £40 million to build. 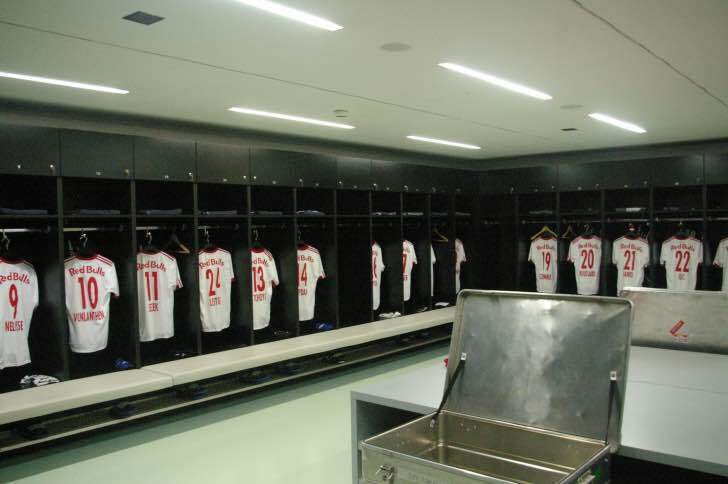 The Arena opened originally with a match between Wüstenrot Salzburg and FC Kärnten, with FC Red Bull Salzburg hosting Arsenal in July of 2007 after the newly expanded stadium opened for the first time. The idea was for the stadium to return to its normal capacity after the Euros as promised to local residents, but the management team broke their promise. Just one of the many reasons people don’t like the club. 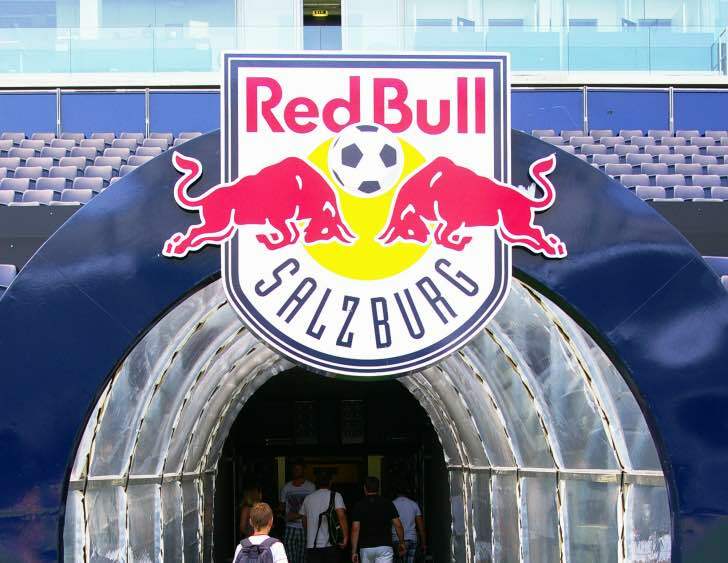 Given that Red Bull Arena was expanded only around a decade ago and that less then eight thousand people attend FC Red Bull Salzburg matches on a regular basis, it’s unlikely that there’ll be any major changes to the place any time soon.